A decapitated body with its head placed between its legs and two skeletons buried in rare fully extended positions have been discovered during an excavation at a proposed £250 million armed forces training facility in Hampshire, where archaeologists say the late Roman community may have been rooted in tribal tradition. At least 11 burials have been found at Worthy Down, notable for their “surprisingly wide” range of interment practices and typically hobnailed Roman footwear and boots. “The contrast between how these Romans lived and how modern service personnel will live in the new facilities we’re providing is stark,” said Stuart Adamson, the Project Manager who oversaw the preparatory groundwork for the Defence Infrastructure Organisation. Some 3,400 years before the roaring torrent of the A303 road sliced theStonehenge landscape in half, some people cut a beautiful pit a metre deep into the chalk with no tools except picks made of red deer antlers. 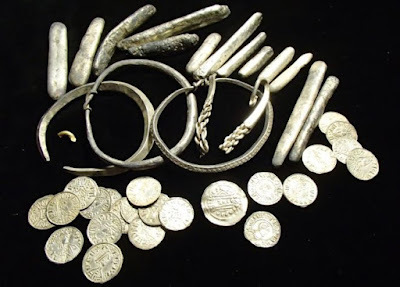 A rare Viking hoard of arm rings, coins and silver ingots has been unearthed in Oxfordshire. The hoard was buried near Watlington around the end of the 870s, in the time of the "Last Kingdom". This was when the Anglo-Saxon kingdoms of Mercia and Wessex were fighting for their survival from the threat of the Vikings, which was to lead to the unification of England. Archaeologists have called the hoard a "nationally significant find". The hoard was discovered by 60-year-old metal detectorist James Mather. He said: "I hope these amazing artefacts can be displayed by a local museum to be enjoyed by generations to come." 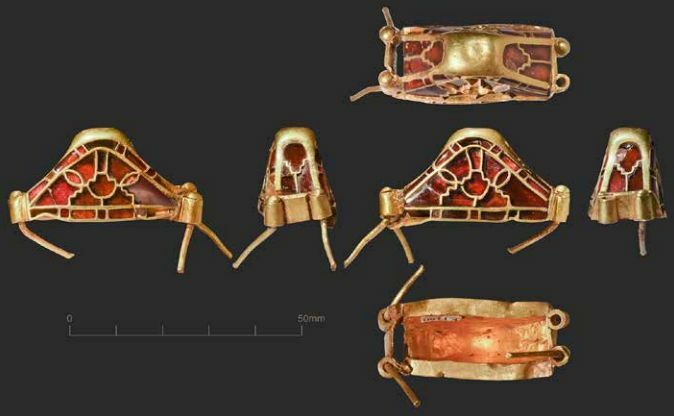 The find in October was lifted in a block of soil and brought to the British Museum, where it was excavated and studied by experts from the British Museum in London and the Ashmolean Museum in Oxford. A 500-year-old artefact is one of the earliest depictions of a mythical figure from medieval Europe, an expert has claimed. Metal detectorists found the spoon handle with an engraving of "Wild Man" near Woodbridge in Suffolk. 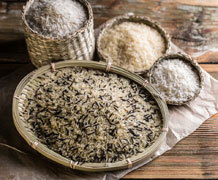 A leading historian has hailed the discovery as a "rare find". Some of the earliest writings about The Wild Man come from Spain in the 9th Century and he was described as "barbaric, chaotic and unrestrained". 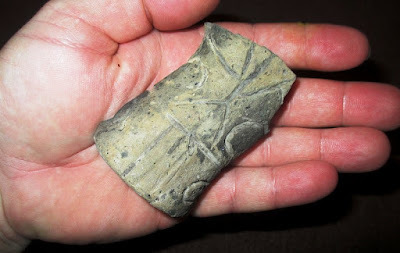 The 15th Century handle, found two years ago, was declared as treasure at an inquest in Ipswich this week. Covered in leaves and brandishing a club, the hairy Wild Man was a popular medieval mythical figure mostly found in pictures and literature rather than on objects. The discovery of 23 Roman skeletons in Lincoln is one of the most significant finds in the city in recent years, say archaeologists. 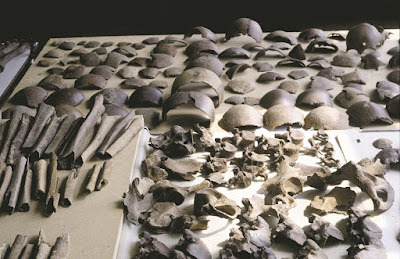 Despite being a major Roman colony, few burial sites from the era have been unearthed compared to places like York or Winchester. Now experts say they hope to "fill a huge gap our knowledge" about people who lived there in ancient times. The dig took place in the Newland area, ahead of the construction of flats. Neil Price, Professor at the Institution for Archaeology at the University in Uppsala has been granted 50 mill SEK (5.4 mill EUR/5,9 Mill USD) to study “Vikingafenomenet” – The Viking Phenomena. “The Viking Phenomena” is an umbrella programme that shelters several sub-strands, with a principle focus on the polities of eastern Scandinavia in the mid-eighth century. A primary objective is the final, full publication of the Vallsgärde cemetery – Uppsala’s most prominent archaeological excavation over the years – to be undertaken by a team coordinated under the direction of Neil Price. This will be supported by an international collaborative arm with an Estonian team, conducting detailed post-excavation research on the extraordinary twin boat graves discovered at Salme on Saaremaa, which seem to represent the casualties of a raid on Estonia launched from Swedish Uppland, perhaps even by the Valsgärde people themselves. The conservation team have been busy with reconstruction of the fragments of silver and silver gilt objects recently. Alongside the conservation work the team have been busy presenting the hoard project at conferences, including the European Archaeological Association conference in Glasgow and Monumental Treasures conference in Helsinki. The pieces, discovered in a German library, bear “remarkable similarities” to the Irish national icon and could even pre-date ‘The Book of Kells’. ‘The Book of Kells’ is thought by scholars to have been produced on the island of Iona, in Gaelic Scotland, around AD 800, although conflicting views have suggested that its origins could lie in English Northumbria or in Pictland in eastern Scotland. 6th century AD male skeleton with prosthesis in situ during archaeological excavation at Hemmaberg, Austria. Right: Evidence of amputation of the left foot and ankle. The analysis of the skeleton, which will be published in the March issue of the International Journal of Paleopathology, was led by bioarchaeologist Michaela Binder of the Austrian Archaeological Institute (OEAI). She and her team pored over the bony evidence, and also x-rayed and CT scanned the remains, in order to learn as much as possible about this man’s life and injury. His name is lost to history, but his bones provide a wealth of information. Man's best friend came about after generations of wolves scavenged alongside humans more than 33,000 years ago in south east Asia, according to new research. Dogs became self-domesticated as they slowly evolved from wolves who joined humans in the hunt, according to the first study of dog genomes. And it shows that the first domesticated dogs came about 33,000 years ago and migrated to Europe, rather than descending from domesticated European wolves 10,000 years ago as had previously been thought. Scientists have long puzzled over how man's best friend came into existence but there is conflicting evidence on when and where wild wolves were first tamed. 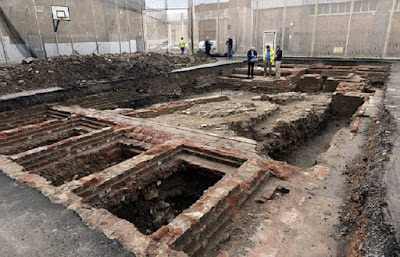 The remains of a Norman castle similar to the Tower of London have been found buried under the court of a disused prison. The old walls of the keep, dating back to 1110, were unearthed by archaeologists investigating the site in the centre of Gloucester before it is redeveloped. The castle was the first in Gloucester to be built of stone and housed three chapels, two drawbridges and a royal chamber for both the King and Queen. Neil Holbrook, chief executive of Cotswold Archaeology, said: "I am surprised by what we found. Professor Martin Jones is pictured with millet in north China. Archaeologists say they have proven for the first time that Julius Caesar set foot on what is now Dutch soil, destroying two Germanic tribes in a battle which left around 150,000 people dead. The two tribes were massacred in the fighting with the Roman emperor in 55 BC, on a battle site now at Kessel, in the southern province of Brabant. 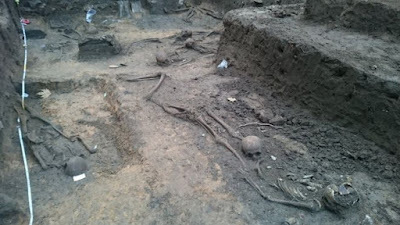 A wealth of skeletons, spearheads, swords and a helmet have been dug up at the site over the past three decades. A large Roman ship that sank full of fish sauce has been discovered of Italy's coast. Archaeologists have discovered an ancient Roman vessel laden with 3000 jars of delicious Roman fish sauce – or garum – on the seabed off the coast of Italy. The find was presented on Thursday by archaeologists, who spent almost two years searching for the 25-meter wreck in the deep blue waters five miles of the coast of Alassio, in the northeastern Liguria region. "It's an exceptional find that dates to the first or second century AD," Dr. Simon Luca Trigona, who led the team, told The Local. “It's one of just five 'deep sea' Roman vessels ever to be found in the Mediterranean and the first one to be found off the coast of Liguria. We know it was carrying a large cargo of garum when it sank." A trove of Viking jewelry and Saxon coins unearthed by an amateur treasure-hunter in a farmer's field may help rescue an English king from obscurity. The Watlington Hoard, a collection of silver bands, ingots and 186 coins unveiled at the British Museum Thursday, dates from a tumultuous period. The coins were minted during the reign of Alfred the Great, ruler of the Anglo-Saxon kingdom of Wessex, who battled a "great heathen army" of Viking invaders during the 9th century. By coincidence, discovery of the hoard coincides with the broadcast of "The Last Kingdom," a big-budget BBC drama series that has boosted popular interest in the conflict between Alfred and the Vikings. Alfred is renowned as the ruler whose victories helped create a unified England, but some of the coins in the hoard also bear the name of the far more obscure King Ceolwulf II of Mercia, a neighboring kingdom to Wessex. "Poor Ceolwulf gets a very bad press in Anglo Saxon history," said museum coins curator Gareth Williams. What little is known of him was written at Alfred's court and paints Ceolwulf as "a puppet of the Vikings." 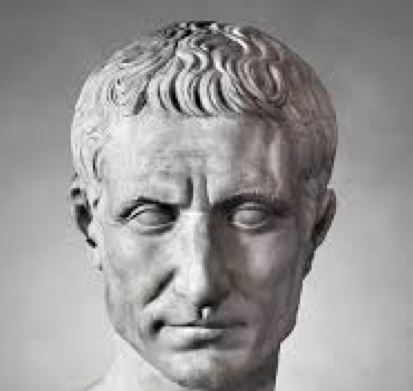 Dutch archaeologists claim they have proof Roman emperor Julius Caesar spent time in what is now present day the Netherlands, after finding remains of a battle site near Oss in Brabant. They say they have found the location where Caesar fought against two German tribes in 55 BC and that this is the first battle field in the Netherlands. Archaeologist Nico Roymans of Amsterdam’s VU University, says this is the first time the presence of Julius Caesar on Dutch soil has been proved. Until now, the site of the battle, which Caesar describes in his account of the Gallic wars, De Bello Gallico, was unknown. CIRCLE OF DEATH A circular pit excavated in France (left) contains the remains of eight people probably killed in a violent attack around 6,000 years ago. Seven severed left arms lay at the bottom of the pit. A diagram of the pit discoveries denotes bones of each individual in different colors. A gruesome discovery in eastern France casts new light on violent conflicts that took lives — and sometimes just limbs — around 6,000 years ago. Excavations of a 2-meter-deep circular pit in Bergheim revealed seven human skeletons plus a skull section from an infant strewn atop the remains of seven human arms, say anthropologist Fanny Chenal of Antea Archéologie in Habsheim, France, and her colleagues. Two men, one woman and four children were killed, probably in a raid or other violent encounter, the researchers report in the December Antiquity. Their bodies were piled in a pit that already contained a collection of left arms hacked off by axes or other sharp implements. Scattered hand bones at the bottom of the pit suggest that hands from the severed limbs had been deliberately cut into pieces. A Viking hoard discovered by an amateur metal detectorist could prompt the re-writing of English history, after experts claimed it shows how Alfred the Great “airbrushed” a rival king from history. Ceolwulf II of Mercia is barely mentioned in contemporary records and largely forgotten by history, only briefly described in the Anglo-Saxon Chronicle as an “unwise King’s thane”. But as of today, his reputation might be rescued after a haul of coins dug up after more than 1,000 years suggested he in fact had a powerful alliance with Alfred, ruling their kingdoms as equals. 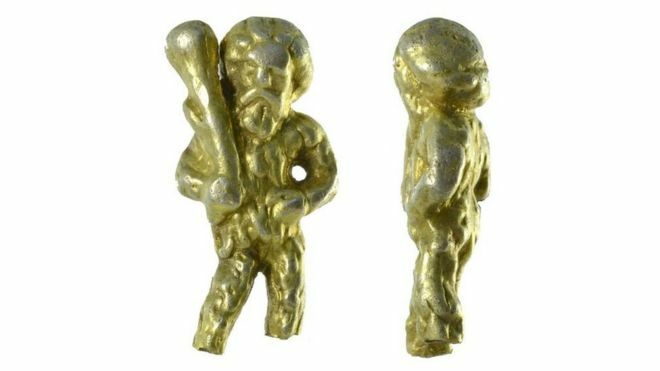 Archaeologists in the east Moravian town of Přerov have discovered a unique statuette which they believe dates back to the early Neolithic period. The richly ornamented torso has been hidden under ground for over seven thousand years ago. The valuable finding was discovered during initial excavations of an archaeological site near Lipník nad Bečvou, a small town on the edge of the Moravian Gate valley. It is a torso of a body, or what the archaeologists call an anthropomorphic sculpture, richly engraved with geometric ornaments. It is about 76 millimetres tall and its head and arms have been broken off. Avant la construction, par Snecma, d’un nouveau bâtiment sur le site de Villaroche, à Montereau-sur-le-Jard (Seine-et-Marne), la Drac Île-de-France (service régional de l’Archéologie) a prescrit des recherches archéologiques menées par l’Inrap. 1 800 m² menacés par les travaux d’aménagement ont donné lieu à une fouille, de juin à juillet 2015. Les recherches ont démontré que le site a été occupé à plusieurs reprises au Paléolithique moyen (entre - 300 000 et - 40 000 avant notre ère). De nombreux outils en silex associés à des restes de mammouths datés de la dernière glaciation (autour de 100 000 ans avant notre ère) ont été mis au jour. Ces découvertes sont d’autant plus inédites qu’elles sont faites en contexte de plateau. Elles éclairent de façon singulière les comportements de subsistance des groupes humains à cette période. The ‘Useful Websites’ on the EMAS website has now been totally updated. Both these list are filtered by period to make them easier to use. There is an extra section with the entire 42 articles of the ‘Mick’s Travels’ series from the CBS’s ‘British Archaeology’. In this series, Mick Aston wrote about the archaeology of various places which he had visited. The castles built by Edward I are considered to be the epitome of medieval military architecture. This study tour will visit the major Edwardian castles in North Wales and some of the 'Lordship Castles' and castles that were repaired by Edward during his Welsh campaigns. We will visit the following castles: Beaumaris, Caernarvon, Chester, Chirk, Conway, Criccieth, Denbigh, Dolwyddelan, Flint, Harlech, Holt, Hope, Rhuddlan and Ruthin, as well as exploring the city walls in Caernarfon and Conway. As we will be based in Caernarfon, we will also be able to visit Segontium Roman Fort. The cost of this study tour is £502 per person sharing a twin room and £648 per person in a single room. Did our ancient ancestors 'kill the cat'? Our ancient human cousins may have fought off big cats with spears, according to archaeological evidence. 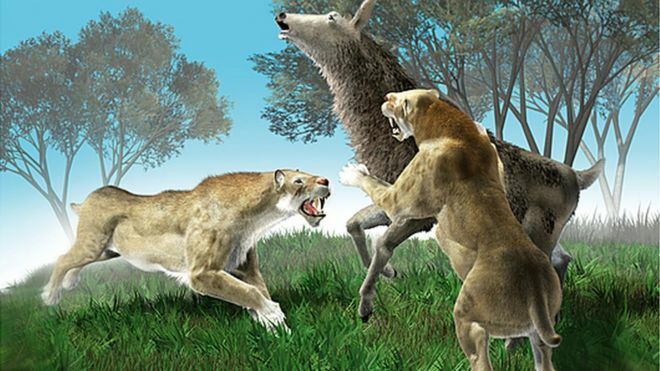 The sabre-toothed cat lived alongside early humans, and may have been a fearsome enemy, say scientists. Several feline teeth - and a chunk of arm bone - were uncovered at a site in Germany known for the oldest discovery of human spears. The 300,000-year-old animal fossils are described as "spectacular". The sabre-toothed cat - once known as the sabre-toothed tiger - lived from about 55.8 million to 11,700 years ago. Archaeologists in Stratford-upon-Avon have made a massive discovery at the site of Shakespeare’s former home . The Shakespeare Birthplace Trust announced on Friday November 27 that the the team excavating New Place had uncovered the cold storage and hearth area of the house. This kitchen area had been lost under layers of earth for hundreds of years. Boodie Cave on Barrow Island is yielding an ancient secret of global significance: resourceful, well-fed humans were living in its limestone chambers more than 50,000 years ago, several thousand years earlier than archaeologists had ­estimated. 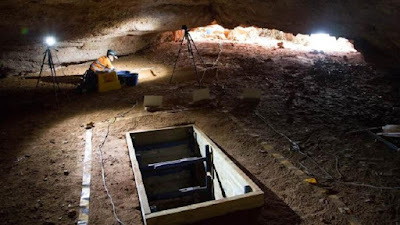 The startling evidence has been unearthed in surgically excavated pits on Barrow, Western Australia’s second largest island, 50km off the Pilbara coast. Thousands of tiny artefacts lie in sediment dated to 50,000 years old in an Oxford University laboratory, where 200 single sand grains were measured by optically stimulated luminescence. Before then, movement of archaic humans were slow and largely governed by environmental events due to population increases or ecological changes. Afterwards populations spread with remarkable speed and across major environmental barriers. Multiple 1,500-year-old mosaics discovered on the floors of the Byzantine Empire's Great Palace of Constantinople in 1932 will undergo conservation work for the first time in 28 years. The work will be carried out by experts from the Istanbul Restoration and Conservation Laboratory. 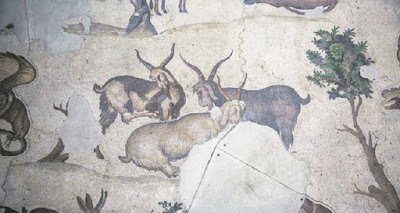 As a part of the project, the Great Palace Mosaic Museum, which displays the mosaics, will be restored for a modern exhibition. Speaking to Anadolu Agency, Harullah Cengiz, the director of Hagia Sophia Museum with which the Great Palace Mosaic Museum is affiliated said the Grand Palace mosaics are the first and only historical artifacts that are being displayed at the site where they were originally discovered. The museum welcomes about 100,000 tourists annually, and that number increases every year, indicating how much the museum is recognized at home and abroad. Archaeologists have found Shakespeare’s kitchen during a dig at the bard’s home in Stratford-upon-Avon. 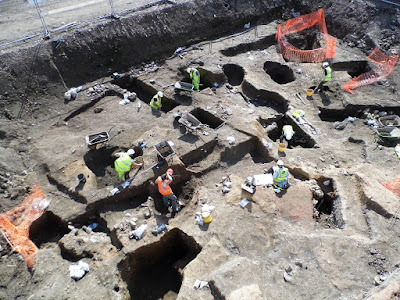 A hearth and cold storage pit, fragments of plates, cups and other cookware were also found during the dig led Staffordshire University's Centre of Archaeology. 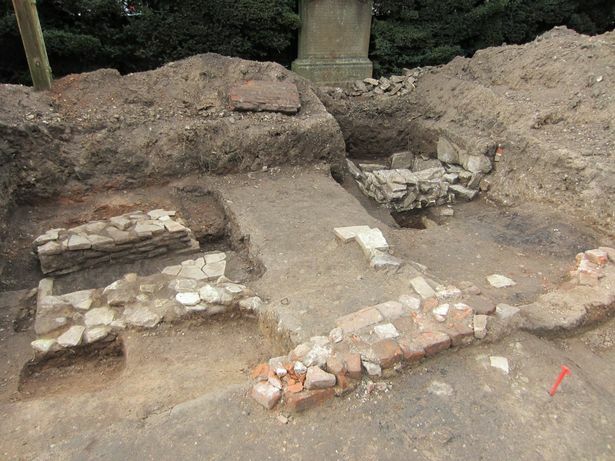 The team also found a hearth at New Place, which was bought by Shakespeare in 1597 and where he lived for 19 years. According to the Shakespeare Birthplace Trust, the dig revealed the breathing man behind the great works – “husband, father and son of Stratford". Archaeologists say they have made a ground-breaking discovery on Anglesey. 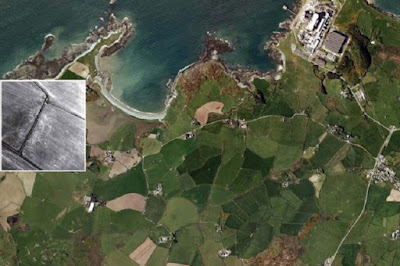 Experts have found what appears to be a small Roman fort on land near Cemlyn Bay and close to the Wylfa power station,. The 'fortlet' is thought to date back to the first century AD and is surrounded by a circular ditch which has not been seen anywhere else in Wales. And the Gwynedd Archaelogical Trust says the discovery is particularly exciting because it is the first early Roman military site to be found on the island. The conquest of Anglesey was famously described two thousand years ago in lurid detail by the Roman senator and historian Tacitus. 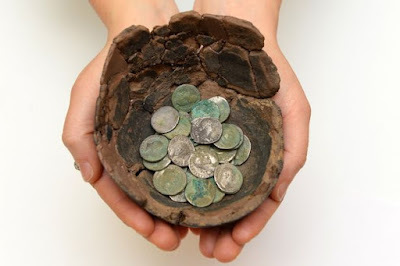 A hoard of silver coins issued by Roman general Mark Antony, discovered in a Welsh field more than 2,000 years after they were buried, have been declared treasure. The coins, which experts believe could be worth tens of thousands of pounds, were found by two friends out walking with metal detectors near the village of Wick, Vale of Glamorgan. One of the pair, consultant psychiatrist Dr Richard Annear, 65, reported the find to curators who were able to lift a small pot containing the coins out of the ground, according to the South Wales Evening Post. 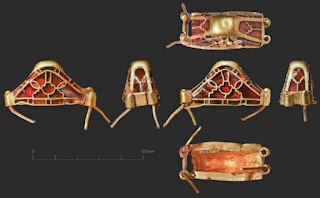 As gold jewellery goes, it could be considered to be quite modest, but a 6,600 year old pendant discovered at the site of one of Europe's oldest prehistoric towns may be the world's oldest bling. 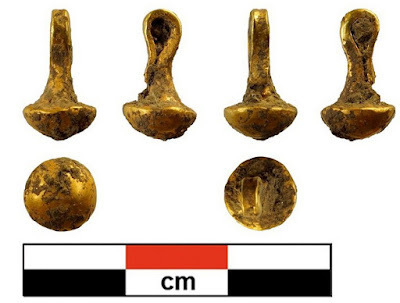 The tiny two-gram pendant was discovered during excavations at the archaeological site of Solnitsata in the Varna region of Bulgaria. Archaeologists believe the area may have been part of an advanced prehistoric society that was among the first to work out how to process and produce gold goods. The necropolis at Solnitsata, which means 'Salt Pit', is situated just to the north of the Bulgarian city of Provadia. Excavation with some of the elephant bones exposed. A new Lower Paleolithic elephant butchering site, Marathousa 1, has been discovered in Megalopolis, Greece, by a joint team of researchers from the Ephorate of Paleoanthropology and Speleology (Greek Ministry of Culture) and the Paleoanthropology group, University of Tübingen. 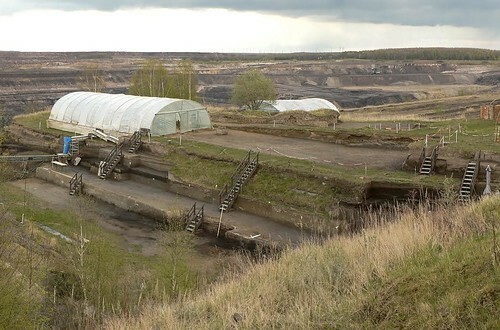 Marathousa 1 is located in an open-cast coal mine, on what was once the shore of a shallow lake. It has yielded stratified stone artifacts in association with a nearly complete skeleton of Elephas antiquus, as well as the exceptionally well-preserved remains of fauna (rodents, birds, amphibians, reptiles, mollusks and insects) and plants (wood, seeds, fruit). The association of lithic artifacts with the elephant remains, as well as the discovery of cutmarks on elephant bones, indicate that Marathousa 1 is an elephant butchering site.